Most people (especially women) have been to a live, in-home direct sales party at some point in their lives and they may even have hosted them in the past, but not everyone has hosted an online party and while there are many similarities, there are several important differences in them too. As the consultant, YOU are the expert and you need to invest time in helping your host have the best experience and outcome possible with her party. Properly coaching her (or him!) through the steps of the party, impacts every party of your business. It affects your sales, it affects your bookings and it affects your recruiting. So how do you ensure that your host knows exactly what is expected of her? First thing’s first, YOU need to know what to do! 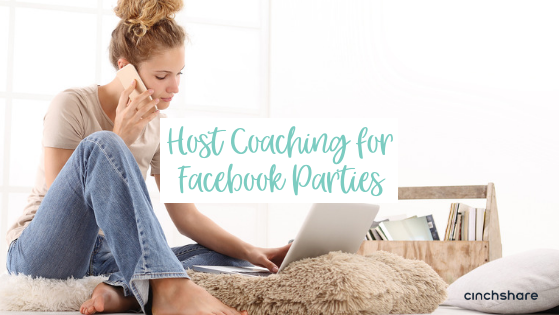 Host coaching can make or break your online parties. We believe in it so much that we created a free printable to help you track your communication with your Host and give you something to reference as you build your business online using Facebook Parties. Using this guide will help you two work as a team for the ultimate party success! Every Host you book for a Facebook Party should still receive a party packet in the mail with catalogs and other party materials. That’s right, we mean good old fashioned snail mail! Your Host will see people who are not online at church, sports practices, club meetings, etc. that can still place an order with her. Do not think that just because she is hosting her party online that she wouldn’t want a party pack and catalogs to show local friends. And let’s get real, getting an actual catalog in her hands will get her even more excited about the products and what she can earn for free! The more invested she is in the party as a whole, the better the party results. So where should you and your Host throw your Facebook Party? We believe that parties in Facebook groups truly allows business owners the ability to offer exceptional customer service to their audience. Groups promote relationship building by highlighting the most popular conversation to the top of the feed, which allows group members and party guests to really be a part of the most current conversation. That’s where you want to be as both a group member and a group admin so you don’t miss a beat. Parties in Facebook groups also allows consultants the opportunity to be better connected with their party Hostess and guests because group posts are given higher priority in Facebook’s newsfeed, which means that your posts are more likely to receive more views, resulting in more engagement and higher party sales. The great thing about Facebook Parties is that there are so many options for your Host to choose from. Does she want to do a quick 30 minute party where everyone comes together at the same time for a live online party? Or does she want to space it out over a few days or a week so people can check in at their convenience? Having a couple options for your Host to choose from will help her to say yes to having a FB Party with you. How could she say no when the party format is up to her? Check out this blog where we share 5 different party length options: 30 minute party, 1 hour party, 3 day party, 1 week party and the 10 day party! Regardless of which party length(s) you offer, you can completely pre-schedule the entire party using CinchShare, which allows you to be there to engage with your attendees verses searching for what to post next. Another great way to have her jumping at the chance to party with you is to make it incredibly fantastic and fun! It’s easy to knock her socks off when you create a one-of-a-kind theme party. Have a few different themes that you can offer to your Host and she will love picking out the one that she knows her guests will love! We highly encourage you to pre-record 3-5 Facebook Party Host Coaching videos to send to your party hosts/hostesses each time. These videos should be short and to the point, usually 2 minutes or less. You can communicate what you want her to know in what is called “just in time information”. What does she need to know right now? – ‘I’m So Excited’ video where you let her know how excited you are to be her party consultant and how you are commited to making this a super fun and successful event for her and her friends. – ‘I Set Up Your Event’ video where you let her know that you set up her FB Party, made her a co-host and now how to go about inviting her friends to the party. – ‘Outside of FB’ video where you share party tips for collecting orders using her party pack from friends she is seeing face to face. – ‘Party Day’ video where you connect with her the day of the party for last minute tips to make her party amazing. – ‘Closing the Party’ video where you check in with her about tips to generate last minute sales and the steps of closing the party and order delivery. Does the example list above have your creative juices flowing? How about a super sweet FREE printable to help you narrow down which videos you want to create for your Hostess Coaching communications? We’ve got your back! Three days prior to the party, your pre-communication with your Hostess should focus on party attendance. Make it easy for her to invite people to the party, give her the party link to share and remind her to reach out to her friends. We all have friends that we use specific methods of communication with, some we need to text, some we need to email. We know our friends preferred communication methods and your host knows this about her friends too. Give her the link and a few quick tips and let her do her thing! Whatever party type you choose, you need to communicate with your Host on the morning her party is to start with some last minute tips, but more importantly, some last minute encouragement. If you have ever been a party host, you know the stress of trying to make sure the party doesn’t flop and people actually show up. Your job the morning of the party is to put her mind at ease, get her excited about her party and help her do her reminders. You’e helping her focus on shooting for 25 people RSVPing for her party because you really want a minimum of 25 people who WANT to be there and who CHOSE to be there. 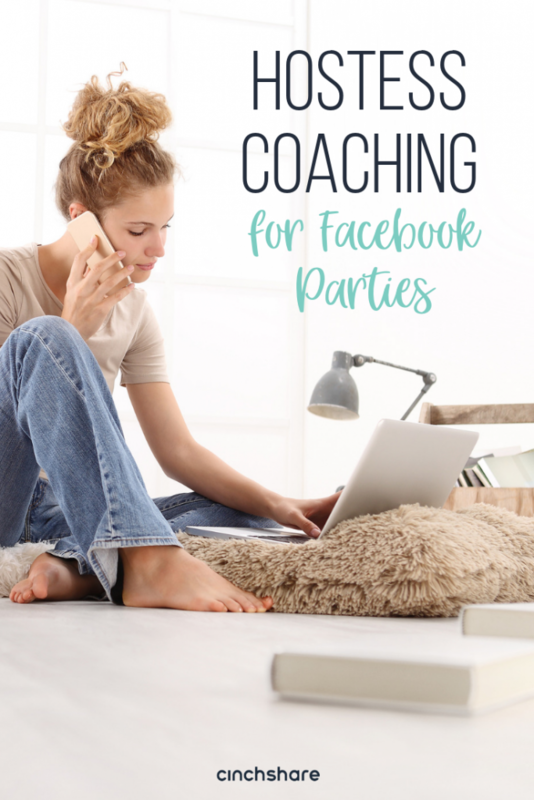 Coach her to send the party link to her friends so they can just click on the link to get to the party, making it easy for them. You might even consider giving her a free gift or reward when she has 25 ‘Going’ RSVPs! CinchTip: Still need to set up your party? Batch Post it! This allows you to take a previous party and repost it with a new date and time in a couple minutes! A half hour before the party starts, your Host is going to be simultaneously excited and anxious so you’ll want to calm her fears and build the excitement factor. Praise her for getting the 25 RSVPs for the party, reaffirm for her how awesome the party will be and how much fun her guests will have and then walk her through her role for the party. Encourage her to LOVE (not like) the party posts, to comment authentically on every single post and if she sees something a friend would really love or something they need that she knows to tag them on it! CinchTip: Be sure to use CinchShare’s Find & Replace feature to make sure that the Host’s name, party link, etc are all updated in the new party. Always run a quick check just to be sure! During the party, connect with your party Hostess on Facebook Messenger and ask her to keep it open throughout the live party time so you two can chat quickly. This has been such a party lifesaver for many seasoned FB Party Consultants. It allows you to talk with the Host during the party, answer her questions, provide in-the-minute Host Coaching tips while the party is going on, encourage her, praise her and bottom line, it puts both of you on the same team and it shows her you are there and working for HER that night! If you’re throwing a live party for 30 minutes or 1 hour, it might take a few minutes for the party to really get going as people are trickling in and this is when your party host might start to freak out a little. Be sure to let her know that this is normal and that she may want to reach out to a few friends who said they would be there but unintentionally might have forgotten. Help her out by posting something early on that invites the guests to respond right away, something they WANT to respond to that’s fun and easy. When you post something like that right away which guests will engage with, the party host knows who is there and who is not, so she can start her last minute “party starting!” messages to those who are not there yet. And let’s be honest, the more engagement and interaction you can get on a party, the better the party! Since you already have your Host pulled up on Facebook messenger, be sure to send her a ‘great job’, ‘loved your friends’, ‘I had so much fun’ message to reaffirm and encourage her a few minutes after the end of the party. This is all part of the continuing to build her up and keep her engaged with you. In this message, you can also let her know the next steps like how long the party will remain open. After the live party has ended, keep in touch with your Host and let her know where she is on party sales, what she has earned so far and what she needs to get to the next reward or level. Where is she on outside orders? Where is she on party bookings? Who has already placed an order? By communicating this information to her she is better able to know who she still needs to reach out to that said they wanted to order and she may also be incentivized to work for the next reward level. Be sure you are dropping seeds about your business opportunity with your hostess regularly during your Host Coaching communications and talk to her about the financial rewards, the fun, the friends you’ve made, the travel, the perks, the discounts, the awesome free product, etc. Keeping her excited is the key to a great party!